A brand new Diary of a Wimpy Kid story for World Book Day 2019! Diary of a Wimpy Kid's protagonist Greg Heffley has chronicled his middle school years in thirteen journals... and counting. 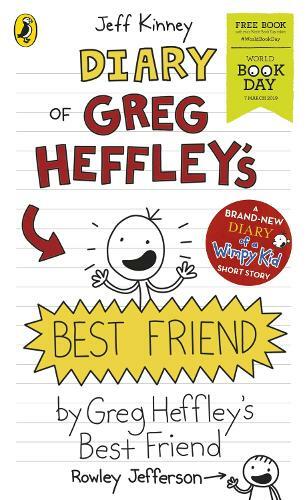 Now it's time for readers to hear from Greg's trusty best friend, Rowley Jefferson, in a journal of his own. In Diary of Greg Heffley's Best Friend, by Greg Heffley's Best Friend, Rowley agrees to take on the role of biographer, recording his pal's every triumph and tribulation. But it turns out Rowley is a poor choice for the job, and his "biography" is a comically rambling mess.